Alex Ovechkin is seeking redemption. Arguably one of the NHL’s greatest players to not have won a Stanley Cup is once again fighting for the prize. His Washington Capitals defeated the pesky Philadelphia Flyers in six games in their first round series. Flyers goalie Michael Neuvirth stood on his head, making 72 saves. But, in the end it was No. 73 that did his team in, as the Capitals won by a score of 1-0 to close out their series. Of course, Braden Holtby was spectacular as well for the Capitals, only giving up five goals in the six games against the Flyers. The Presidents’ Trophy winners and Ovechkin have moved one step closer, but what lies ahead is no easy battle. Huge is a good word to describe what is ahead versus the Pittsburgh Penguins, as would be any number of other descriptions about the Caps’ next opponents: War. Epic. Armageddon on ice. Whatever you decide is an appropriate description for the second round series between these two teams, the potential exists for any prediction to fall short of just how hard they will battle to advance. It will likely be all of the above and more. It may be hard to believe, but this will be only the second time Ovechkin and Crosby have done battle in the postseason. They met in the 2009 Eastern Conference semifinals, which the Penguins won in seven games, eventually going on to win the Stanley Cup. Both Ovechkin and Crosby notched the first hat tricks of their postseason careers in Game 2 of that series. Also, both had eight goals in the series, with Ovechkin notching six assists to Crosby’s five. Needless to say, both team captains are very good at finding the back of the net, and there is no reason to believe that will change in their upcoming match. So Lundqvist's season ends being pulled in back to back playoff games. Yikes. Lundqvist had no answer for Crosby and friends, who looked to be hitting on all cylinders even without starting goalie Marc Andre-Fleury. Backup Matt Murray has played very well, and the Penguins go into their series with the Capitals riding a wave of offensive confidence that Holtby will have to handle. The question to be answered is how will they respond to the likes of Nicklas Backstrom, TJ Oshie, Justin Williams, Evgeny Kuznetsov and of course, Ovechkin? Will Crosby, Phil Kessel, Kris Letang, Evgeni Malkin and Patric Hornqvist chase Holtby? The story lines are almost endless in this matchup between the two Easter Conference powerhouses. Yes, the overarching plot to this drama is Ovechkin. 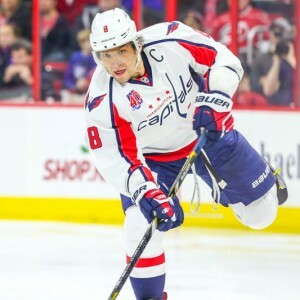 Will the Caps advance and take him closer to Lord Stanley’s Cup, or will he yet again be left empty on the ice? Don’t expect Crosby to be secretly hoping for Ovechkin, as he’d be thrilled to leave the Russian empty-handed once again. No matter the result, it’s going to be an epic battle.